I really enjoyed Debra's Common Ground posts at Leola's. 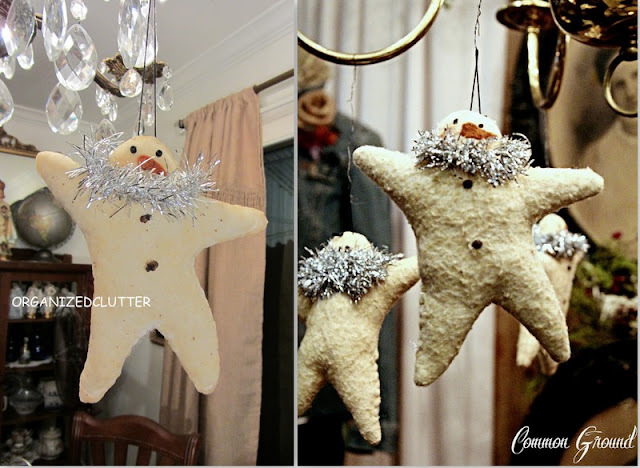 I was inspired to make my own star snowman. I cut out my star snowman from Warm and Natural cotton batting and blanket stitched it around the outside with crochet thread. I stuffed my snowman with some loose polyester fiberfill. I tea stained my snowman a little and also stiffened the snowman body with some water diluted Mod Podge. I glued on an orange felt nose and two black seed beads with tacky glue. And tinsel garland was glued around his neck. I think I might make myself a few more snowmen. How cute is that! You have inspired me to make one. Thanks for sharing Carlene. I think you should plan these hunting trips more often... you are on a roll! He's adorable! It is adorable, and yes make a few more, cause I'm gonna. Did you tea stain the fabric before or after making? If after how do you do that? Too cute! You are so crafty! He's very cute. I didn't know that you could use Mod Podge to stiffen - learn something new every day. Oh how funny!!! these are just adorable, my sis and I both bought one of these the night of the Open House. She had only made 5 and they were all gone before the open house even started. Great job on yours!!! I think you should make a lot more of these adorable snowmen! Your snowman is crafty and cute! Love the tinsel. BTW, LOVE your banner and just finished taking a little tour of your lovely blog and your laundry room is divine! I saw that snowman over at Debra's too, and thought it was so cute. I love the way you made yours, and the cloves for buttons--pretty and fragrant! Nicely done, Carlene! I love snowmen and this one is a real cutie! I adore snowmen & he is just the sweetest! Totally inpired here! I love snowmen and yours is so cute!! This is so adorable, Carlene! Great job! That is stinkin cute!!! Now I have to try that!!! Oh man, Carleen!!! I have just spent three hours (okay, maybe two!) looking at all your fun things on your blog!!! I think we could be best friends!!! I love your garden, your house and all your vintage things!!! I have to get to bed, but would love to chat more, but I do have one quick question, if you might be able to email me back, but when you set out your teapots and galvanized pails, etc., out in the garden and have flowers in them, do you put holes in the bottoms for drainage? I would love to know. You also have a real gift for arranging these things! And I feel your pain about some of the flowers not returning in full force - like your monarda. Mine didn't come back at all this year - very sad!!! (I live in Michigan) I have an old sewing machine that I am ready to put out in my garden, because we just don't have room for it in the house - but can't decide if I want to paint it white or not - ??? Anyway, like I said, I could chat with you for a long time I think...... but love your blog, just wish there were more hours in the day! Your snowman is so darn cute! It looks good enough to eat! When I first saw it, I thought it was a Christmas cookie. Ha! It's adorable! I love it when we see something that is truly inspiring. Carlene, These are too cute! You are really getting into the Christmas spirit. Adorable and so easy! Cute,too. I just finished a quilt and was wondering what to do with the remains of the cotton batting...I see a banner coming. Pinning that cute little bugger. Cute as a button! thanks you for sharing your "how to"! You did a fantastic job on that! Thank you for joining HSH! This is too cute and such a look alike! So easy to do as well. I had seen that and thought of using paper clay. Like your idea better. so cute! I want a whole garland of these!! That is the cutest snowman ever! I'm thinking it's time to get busy and make a few! I just love it. I think the snowmen would make a very cute bunting.